Together with our highly trained Pilates instructors, we have put together an active yet relaxing itinerary for our Pilates retreats in Sicily. With tailor-made classes that will match individual needs, our lessons will suit guests of all levels and abilities. All of our instructors are experts in the Body Control technique – a method of Pilates that focuses on your core – from toning your body to combating back problems, it is suitable for any age or ability. We supply the Pilates material so the only thing you need to bring is suitable and comfortable clothing for the course. The villas where our Pilates holidays in Sicily take place are built in a typical Sicilian style. Chosen because of their locations, they have some beautiful views of the surrounding areas. Within the grounds of the villas, there are beautiful outdoor facilities complete with swimming pools, surrounded by almond and olive trees, with plenty of outdoor space for your Pilates lessons. After a dip, you can sit back and relax on the terrace. Sicily is an ideal place for a Mediterranean island holiday and our villa is the perfect place to kick back and relax. Our transfer will meet you at Catania Airport and take you to the villa where you can settle in, meet your chef and teacher and enjoy welcome drinks. Dinner this evening is at the villa, prepared by your chef. Begin the day with energizing morning Pilates, followed by breakfast. After breakfast, you will have a cookery lesson with the chef followed by lunch. In the afternoon, you’ll have some free time where you might like to take a walk and explore the local area. There will be an evening Pilates lesson before dinner, which is prepared for you at the villa. You will have another Pilates lesson today before breakfast. We will then visit the coastal town of Siracusa, before having lunch in a local restaurant in the old part of the city, Ortigia. You will have some more time to explore after lunch. We will then travel to Noto. Dinner tonight is prepared by your chef back at the villa. This morning you will have another Pilates lesson before breakfast, before heading out to a local beach for a day of seaside relaxation. Enjoy lunch at a local cafe. This afternoon, enjoy your second Pilates lesson on the beach before returning to the villa for dinner. Enjoy Pilates before breakfast then a relaxing morning at the villa. For the rest of the day, you will be free to relax by the pool or take a walk through the countryside. There will be another evening Pilates session before dinner,which is served at the villa by your chef. Another Pilates lesson this morning before your second hands-on cooking lesson. This afternoon, we go to Modica with some time to enjoy the local boutique shops. 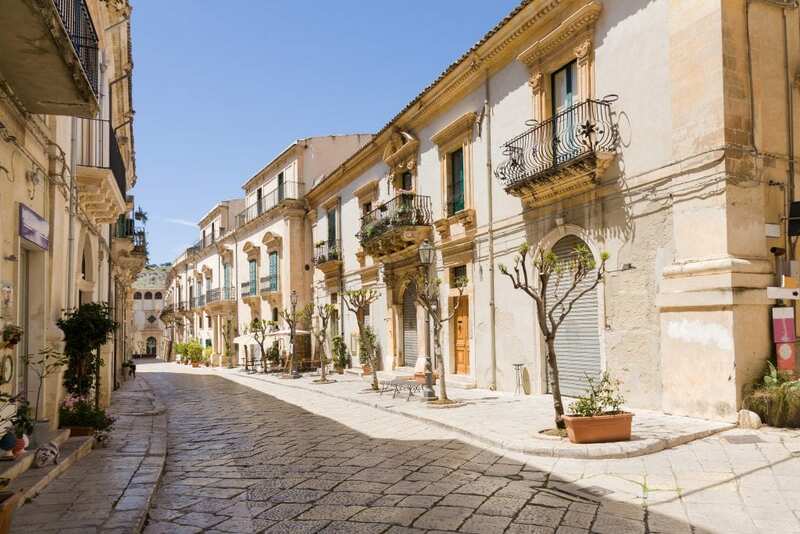 You can then explore the stunning town of Ragusa, before your evening meal at our favourite local restaurant. After our morning Pilates lesson, you’ll have time to relax before lunch. This afternoon will be spent at the villa with time to discuss your exercise programme with your teacher. In the evening, enjoy a special farewell dinner at the villa, prepared by your chef. After breakfast, our transfer will collect you and take you back to Catania Airport for your flight. Arrivederci!